Apart from that, you can also go for window films to cover the windows. 1. Cover the windows: Wellâ¦ this is a good way to save a lot on your air-condition cost. It has been noted that window screens are particularly effective on east and west-facing windows. Apart from that, you can also go for window films to cover the windows. Such films are transparent and reflect the heat before it gets transmitted through glass. 2. Plant trees around your house: In order to keep your home cool and avoid excessive costs of air conditioning, plant trees around your home. Planting of leafy trees around the building's exterior will help you in stopping the sun from reaching inside your home. Apart from that, it has been noted that if you could shade your air conditioner (AC) with trees or shrubs, it will boost the efficiency of the AC. 3. Use your basement for chilling out: Basements are normally cooler than the rest of your house. So, you can utilize your basement by installing a television, couch and arrange for a cold drink and spend a part of your daytime there and save your AC costs. 4. Maintain your AC: Your air conditioner is a machine and requires proper maintenance. You should keep the filter clean so that air movement is proper. Also, if you replace your old AC with a new one, you will actually save on your AC costs. 5. Take a splash: Taking a shower always helps in reducing your body heat and ultimately cools you. If you don't feel like taking a shower, you can use a cool cloth on the back of your neck. 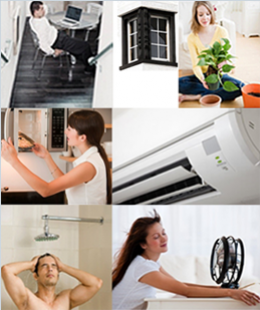 This will surely give you the much needed comfort that you're looking for and also help you save the cost of your AC. 6. Use your microwave: Avoid using a baking oven or stove top boiling. Using a microwave will help you in decreasing indoor heat. Also, make sure that you turn on the kitchen exhaust after you complete cooking. This will help you in reducing the humidity and increase your comfort level. 7. Use a fan: You don't have to go for a fancy fan. You can go for the normal ones If you install a fan in your home, it will help you in circulating the air around your home. Apart from that, moving air also helps in evaporating the sweat from our skin. Thus, you will feel less hot and in the long run help you reduce the AC costs. Get comfortable in this summer. Use AC only when you're at home. There's no point in keeping the AC on 24*7. Raise the thermostat temperature when the weather is pleasant. You can save between 5% and 15% on your air-conditioning cost.